Eastern Bank Ltd. job circular 2017 has been published for vacant position of Sales Executive,card division. 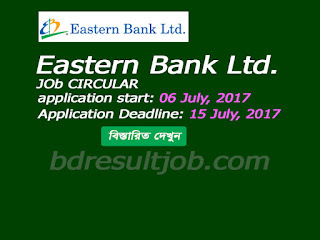 Eastern Bank Ltd. is one of the largest private Commercial Bank in Bangladesh. If you Eligible candidate can apply for the position this job, you should submit your application within 15 July 2017. 1. Post name: Sales Executive, Card Division. 2. Category: Bank/Non-Bank Fin. Institution. a. Ability to sell consumer products mainly; all sort of credit cards and other relevant products. b. Managing sales matrix along with finding potential customers. c. Coordinate with line manager; preparing monthly, weekly & daily report. Graduate preferably in Business Studies/ BBA/ MBA/ MBM or Economics. a. Six(6) Months experience in similar exposure will be an added advantage; fresh graduates are also encouraged to apply. b. Mature, pleasant and presentable personality. c. Good communication and interpersonal skills.